Why do so many men struggle with relationships? It was 1854 when Henry David Thoreau wrote “The mass of men lead lives of quiet desperation.” The behavior that led men there, then, I think was much the same when I was growing up some fifty years ago. My father knew it well. In a nutshell, male equaled masculine, and, female equaled feminine. Masculine stereotypes in Dad's time included no emotional displays, aggressiveness, patience and persistence in adversity, and competitiveness both at work and play. He said under no circumstances should I show weakness. Dad taught me that not being his way was, well, unmanly. No wonder I grew up wearing that tough masculine breastplate. . . and was silent about my desperation. During the early nineteen-sixties, after Dad chose an all-male engineering college for me, I could only read about the social shift that began among some women. These females were very outspoken about breaking away from their gender's stereotyped roles. By the late seventies, the first women engineers showed up in my company's technical sales force. Today, many women have transcended the limitations of female equals feminine, playing roles once dominated by men. And similarly, some men. My doctor now has a few male nurses. As men explore outside the limits of stereotyped masculinity, we each have a personal history that makes us unique among men, including our accomplishments and choices. Yet in common we struggle to meet some expectations, fear failures, and sometimes face difficult relationships, especially with our fathers. Why don't we talk more about these common themes? I didn't when younger because I embraced a competitive nature with every man in my hierarchical company, because at year's end, managers force-ranked us all. Those opinions produced next year's salaries and defined our potential to rise on the corporate ladder. I was near retirement before I discovered I seldom relaxed my competitive stance with men even when not at work. It took me so long because I hadn`t tried to learn very much about myself. But even If I had known more, thanks to my penchant for showing no weaknesses, I still would not have talked openly about myself. After retiring from my profession, dabbling in other aspects of life began to teach me who I was. Today`s workplace now emphasizes teamwork as well as individual performance, and some organizations are trending away from hierarchies making all decisions. Relating with one another is replacing competing. A researcher of human behavior, Brené Brown, found successful people today best build relationships by being vulnerable. * What a change from my attitudes just twenty years ago! Our evolving world is moving toward the importance of relating with one another, even when we don`t agree on issues. 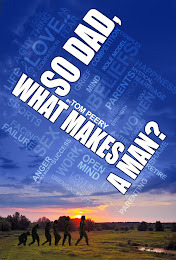 On the back cover of my book So Dad, What Makes a Man?, I wrote "may these anecdotes of one man's life stimulate conversations about life and its transitions with your family members, friends, lovers and those you support." In order to foster building these important relationships, Luis Canales, Lloyd Guerin, and I have created A Walking Tour of Male Spirituality, a workshop that provides a safe place to practice talking more openly about life, with no pressure to be like me or anyone else. By mid-2015, our published facilitator's guide will enable you to lead this workshop yourself for your own men's group or as a couple. If you would like to experience the ten-session workshop before leading one yourself, A Walking Tour of Male Spirituality begins at the Cenacle Retreat House in Houston, January 22. You can register at 281- 497-3131 or www.cenacleretreathouse.org. $125, including the book. Whether you join in this discussion or not, I invite you to talk with people important to you about your life stories, including the tough times.